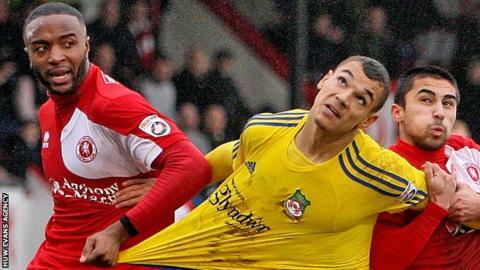 Wrexham have offered new deals to seven squad members for 2016-17, but club captain Lee Fowler is not among them. Fowler is one of 16 players released by the National League club while Kayden Jackson has turned down his offer. Manny Smith, Wes York, Adriano Moke and Blaine Hudson are also among the departures. Defender Sean Newton has signed a new one-year deal and Wrexham are in talks with goalkeeper Rhys Taylor, who has been on loan from Newport County. Jackson was joined in being offered a new deal with Mark Carrington, Rob Evans, Jamal Fyfield, Simon Heslop, Connor Jennings and Sean Newton. The full list of players not retained is: Cameron Belford, Louis Briscoe, Iwan Cartwright, Jake Doran, Fowler, James Gray, Hudson, Moke, Danny Reynolds, Jonathan Royle, Aaron Simpson, Smith, Javan Vidal, Ross White, Joe Williams and York. Wrexham finished eighth and 11 points off the play-offs in their last campaign, prompting manager Gary Mills to say they did not deserve to make the top five.